A correspondent reports confusion at his local post office over the validity of Faststamps. I suppose it is understandable that some sub-postmasters are unsure about restrictions which apply to methods of postage with which they are unfamiliar because they don't sell them. But these can be applied and posted anywhere: they do not have to be posted in the Post & Go box, they do not have to be posted at the same post office, nor even in the same town. They can be used the next day hundreds of miles away, and handed over the counter. 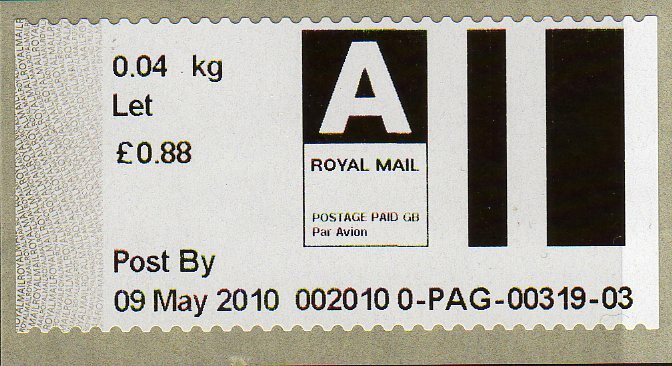 Post and Go Stamps, known to all but Royal Mail as Faststamps are valid for all time, anywhere, for the current value of the service shown, in the same way that 2nd & 1st class stamps, and NVI airmail stamps, are. Let us know of any problems you have had using P& G labels 'out of area', or using old stamps: use the comment button. Thanks for the note about the Frama labels. 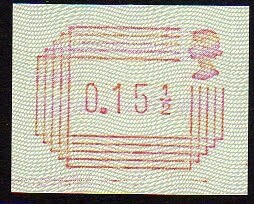 I bought some discount postage recently and it included a 12½p Frama - a real blast from the past! Can you clarify about the halfpenny values though? I'm sure I read that the halfpennies are ignored completely, even if they are in even numbers, so that, for instance, two 20½p stamps would only be counted as 40p rather than 41p. You seem to suggest otherwise - it would be good to know as I have lots of 20½p commems to use up!